Let’s talk about how breakfast cereal is made. Whether it comes in flakes, cute little shapes, or clumps, it’s made from a slurry of grains and water that’s forced through an extruder that will shape the finished product (or puff it up if that’s the effect the manufacturer wants). This is done at great speed, using both high heat and high pressure, important if you need to make thousands of boxes of cereal a day to ship all over the country). But what happens to the food value, the nutrition, the benefits, in the process? Let’s start with the grains themselves. If they’re conventionally raised, you’ll have a hefty dose of pesticides and fungicides on them. Those don’t get washed off before processing into cereal. So guess what might come to breakfast along with that crunchy cereal? 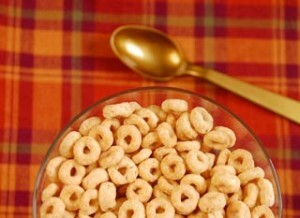 Before you get complacent because you eat only organic cereal, read on! All grains (wheat, rye, oats, rice, barley, you name it) have a component in the hull (the outer coating of the grain) called phytic acid. Phytic acid has the ability to latch on to minerals eaten in the same meal – minerals like calcium, magnesium, potassium, zinc – and take them out of your body before you can use them. It’s possible to de-activate the phytic acid, but this fast grind-squish-bake process just ain’t gonna do it. So when you eat highly processed cereal, not only are you missing some of the nutrition that’s supposed to be in there, you’re actually losing the minerals from anything else you ate with it. But you get a full day’s vitamins from eating a bowl of cereal, right? Let’s have a look at that. Since the B vitamins naturally found in whole grain have been trashed by the processing, the manufacturer thoughtfully adds some of them back in. They’re not the same quality, or even quantity, as the ones that would have been there if the grains weren’t messed with, and you don’t even get all the vitamins that were taken out; there’s just enough to meet the RDA (don’t even get me started on that). And guess what? There’s a good chance that even this attempt to replenish what’s been destroyed may itself be destroyed from the final processing! Nope, sorry, this is just smoke and mirrors, not nutrition. One of the reasons you’re eating cereal is that you know you need a good breakfast, right? Presumably, you think that because it’s made from decent ingredients, that you’re getting something out of it. You may be getting more than you bargained for! Protein molecules, by their nature, are fairly delicate. So there are some completely new components created as the original protein bonds unlock and reconnect in new ways under high heat and pressure. These new compounds can actually be toxic to the nervous system. Life is tough enough – why add neurotoxins to the mix? OK, this might be a bit radical for some of you. But I include it because I believe that it is important to consider the source of your food. Do you really want to purchase and eat food that is made as cheaply as possible, and marketed as healthy and beneficial? Do you really want to support an industrial food juggernaut that thinks that we are so dumb that we’ll keep buying food that not only fails to nourish us, but that actually causes us harm by starving us? So maybe you’re thinking that that box of wheaty O’s isn’t looking so hot. But now what do you do for breakfast? Here are some choices that will really keep you nourished until lunchtime, without the blood sugar crash that can happen after a nutrient-thin bowl of flavored breakfast cardboard. Warm up what you didn’t finish yesterday at dinner! If what you have left over is just vegetables, warm them up in butter and/or olive oil and/or coconut oil, then add some eggs and make a quick scramble. Top with cheese if you like. Have with toast. Whatever. Easy, quick, and nourishing. Here’s a real old-fashioned breakfast for you. And quick, too. But because of the phytic acid noted above, you’re going to want to prepare it in such a way that you minimize this anti-nutrient. The good news is that doing so makes it even quicker to cook! For one serving, take 1/2 cup of oats and mix them with a little yogurt (a spoonful, measurement not needed) and 1/2 cup warm water. Put it someplace warm (oven with light on, for instance) overnight. In the morning, bring another 1/2 cup water to a boil, dump in your soaked oat-and-yogurt mixture, add a healthy pinch of salt, and turn the heat down low. Cover and simmer tlll creamy, stirring once or twice. It only takes about 10 minutes to cook. Serve with loads of butter, honey if you like, heavy cream from grass-fed cows (if you like), or yogurt, or unsweetened fruit preserves, or toasted nuts. Eggs are an excellent source of protein, along with some stellar carotenes and other nutrients in the yolks. Cook them gently; don’t turn them into rubber, if you want to have a happy digestive experience. Bacon (please, from healthy animals, naturally cured) is a lovely accompaniment. And so is toast from real sourdough bread (there are several brands at the market made from whole wheat or rye, sourdough culture, water and salt, usually in the frozen section), slathered with butter made from the cream of cows fed on grass. Kerrygold is a good brand that’s readily available, but there are others – you want to look for something on the label that says the cows were raised on pasture, just like your eggs! So stay away from the fake stuff, eat the real stuff, and I promise you that your day will go way better! This entry was posted in Cooking, Health, Nutrition and tagged breakfast, cereal, health, industrial, phytic acid, processed foods, recipe by Blochster. Bookmark the permalink.